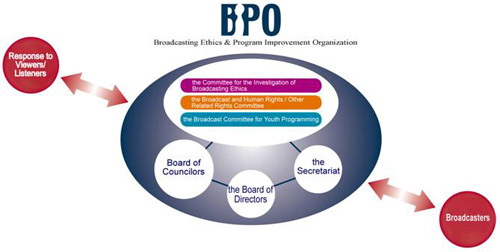 The Broadcasting Ethics & Program Improvement Organization (BPO) is a non-profit, non-governmental organization that serves to improve the quality of broadcasting and promote higher ethical standards while ensuring freedom of speech and expression. BPO deals with complaints and ethical issues by conducting investigations into problematic programs and giving recommendations and/or opinions to either all broadcasters or to the particular broadcaster concerned. If one of the Committees determines that an ethical problem exists, the BPO member broadcaster concerned is required to submit, within a prescribed period, a progress report of the corrective measures taken. BPO discloses such reports to the public. BPO was established by the Japan Broadcasting Corporation (NHK) and the Japan Commercial Broadcasters Association (JBA). To ensure impartiality of the organization, members of each Committee are selected by the Board of Councilors, which consists of individuals other than broadcasting company executives or employees. Of the ten members of the Board of Directors, the Chairperson and three Directors are selected from third-party individuals. BPO is funded by annual membership fees from NHK, JBA and JBA member broadcasters. The Board of Councilors selects members of the three BPO Committees: the Committee for the Investigation of Broadcasting Ethics, the Broadcast and Human Rights/Other Related Rights Committee and the Broadcast Committee for Youth Programming. The Board of Councilors is comprised of seven members or less who, like the Committee members, are selected by the Board of Directors from individuals other than broadcasting company executives or employees. The Board of Directors selects the Board of Councilors and gives approval to BPO’s annual plan, budget and financial statements. The Board is composed of a Chairperson and nine Directors. The Chairperson is selected from individuals other than current or former broadcasting company executives or employees. The Chairperson selects three Directors from individuals other than broadcaster executives or employees, and the Japan Broadcasting Corporation (NHK) and the Japan Commercial Broadcasting Associations(JBA) each select three Directors. 0 Additionally, it acts on aired programs with allegedly falsified content that may have created grossly misleading impressions on viewers/listeners by performing investigations to find out whether ethical problems exist. Results of such investigations are publicly announced in the form of “recommendations” or “opinions.” It also has the authority to require broadcasters to submit a report of measures designed to prevent the recurrence of such problems and how these measures are being implemented. BPO has an agreement with each broadcaster to define the scope of authority vested in the Committee and to ensure the effectiveness of its actions by requiring cooperation and compliance from the broadcasters. The Broadcast and Human Rights / Other Related Rights Committee aids parties whose honor, privacy or other human rights have been violated by broadcasting. There are seven to nine members including lawyers, scholars and other experts. From a third-party standpoint, they can make prompt and fair investigations of complaints. No fee is charged for filing complaints or having investigations conducted. The Committee investigates complaints filed by those who claim that their “human rights have been infringed upon” and determines “whether human rights have been violated” or “whether broadcast ethics problems exist”. The results are given as a “Committee Decision” which is notified to both the complainant and the broadcaster, and then publicly announced. The Broadcast Committee for Youth Programming aims to improve broadcasting programs for youth by conducting research on the relationship between youth and broadcasting, as well as the influence of broadcasting on youth. The Committee has six to eight members who are experts in various fields. The Committee examines opinions from viewers/listeners, and exchanges opinions with program producers from the broadcasters. It may decide to make public the findings of such investigations in the form of an “opinion”. In some cases, the Committee may ask broadcasters to review the issues internally. BPO receives opinions regarding broadcasting programs from viewers/listeners via phone, facsimile, e-mail and letters. These opinions are summarized daily and first discussed within the Secretariat; they are then placed on the agenda for the Committees. Opinions about specific programs or broadcasters are reported to the concerned broadcasters on a weekly basis. Representative opinions are summarized monthly and posted on the BPO website. Given the public nature of broadcasting and its increasingly significant influence on society, criticism of broadcasting as a whole had been growing. To deal with this situation, NHK and JBA established the Broadcast and Human Rights Committee in 1997 to advocate for basic human rights from an independent, third-party standpoint with the power to enforce corrective measures promptly and effectively. In 2000, the Youth Committee was established to deal with problems in broadcasting concerning youth. This was followed by the Programming Committee. In 2003, these Committees were integrated into the Broadcasting Ethics & Program Improvement Organization (BPO). In 2007, when falsified/fabricated programs became a major issue, the Programming Committee was dissolved and then replaced by the Committee for the Investigation of Broadcasting Ethics to deal with both falsified/fabricated programs and broadcasting ethics. Copyright © 2003-2019 Broadcasting Ethics & Program Improvement Organization All Rights Reserved.